Lava fields along the way to the upper Etna slopes during a group Etna 4wd excursion. 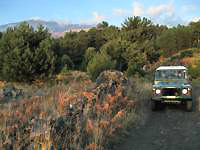 Etna 4x4 shore excursio excursion is an exclusive tour to explore the Mount Etna volcano. Our knowledgeable and enthusiastic guides will show the Etna landscapes and wildness, endemic flora and geological features explaining the surrounding fragile environment. Having care of it, we'll take you following off-road itineraries through Etna's lava fields always driving on tracks, exploring caves, and walking to reach the "Valle del Bove" Caldera's rim, immense theatre of some major last eruptions. After the visit of a lava tunnel and having had a pic-nic lunch with sicilian food and wine, VolcanoTrek's guides will drive you up to 2000 meters, from where we will walk across the lava flows of the 2002 eruption up to the 2002 eruptive fissure (2 hours long roundtrip walk )* to experience the incredible power of nature that surrounds you. * On request, it's possible a shorter walk . Highlights: Eruptive fracture of 2002 Etna's eruption - vents and lava field | Piano Provenzana area and its destroyed touristic facilities | Valle del Bove" Caldera | Lava tunnel** (volcanic cave)|. eruptive fractures, cinder cones, spattern cones, monogenic cones, volcanic bombs, aa lavas, formation of lava flow banks and lava tunnels**. **Safety helmets and flash light are provided by VolcanoTrek. Having only an half day for your Etna excursion, looking for a really easy tour, and having in mind to see as much as possible, the half day excursion by 4wd is the best option. 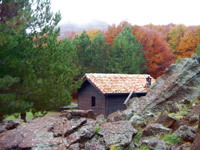 The excursion will start from your accomodation or from a pick up place. 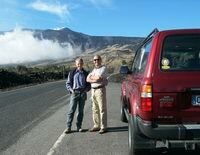 An exclusive half-day Etna 4wd tour to explore the volcano Mt Etna. Our knowledgeable and enthusiastic guides will show the Etna landscapes and wildness, endemic flora and geological features explaining the surrounding fragile environment. Having care of it, we'll take you following off-road itineraries through Etna's lava fields always driving on tracks, exploring caves, and walking to reach the "Valle del Bove" Caldera's rim, immense theatre of some major last eruptions. After the visit of the caldera, VolcanoTrek's guides will drive you up to about 2000 meters, where we will see the effects of the 2002 eruption against the touristic facilities of Piano Provenzana walking across the lava flow to the destroied hotels. On the way back possibility to have a short and easy trekking (1h long roundtrip walk) to the 1865 eruptive fissure. Highlights: Eruptive fracture of 2002 Etna's eruption - vents and lava field | Piano Provenzana area and its destroyed touristic facilities | Valle del Bove" Caldera | . eruptive fractures, cinder cones, spattern cones, monogenic cones, volcanic bombs, aa lavas, formation of lava flow banks.